[May 4, 2017]–They scratched the Tart Peach Kolsch, but added the Sea Rose Tart Cherry Wheat Ale for last night’s Tap Takeover at Wildwood Barbeque in Hadley, Massachusetts. A fair trade. The Mocha Marlin also gave way to the regular Black Marlin Porter, which at 6% ABV was an interesting contrast with the Coconut Victory at Sea, an Imperial Porter with coffee, vanilla and coconut, rolling in at 10%. It was wise to pack in some extra pulled pork to soak that one up. Knowing that Ballast Point was going to take over the taps at the Que, I found a six-pack of the Grapefruit Sculpin, and put it up against Vermont’s Rock Art Brewery’s Grapefruit IPA in a quicky informal tasting with my visiting son, Mike, doing a mini-reunion over the weekend with a couple of his old college buddies, Dan and Alisa DiBlasi, both beer heads. Our panel of four gave the nod to Rock Art, 2 to 1, with one abstention, me, with no clear preference over the two. 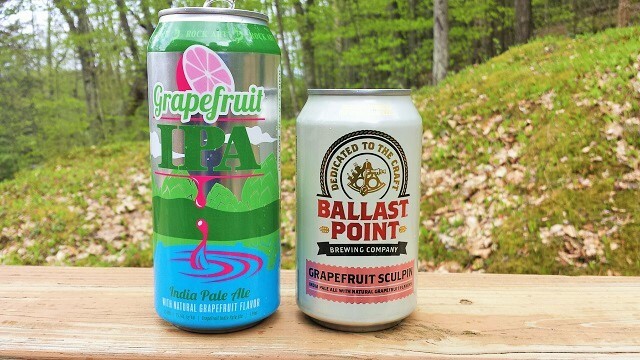 Dan and Mike both preferred the Rock Art, saying the grapefruit presence was more dominant, while the Ballast Point entry tended to be sweeter. 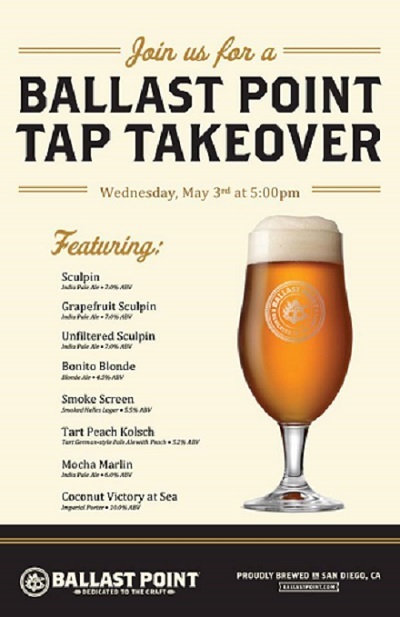 Alisa went along with that, but preferred Sculpin’s sweeter note. 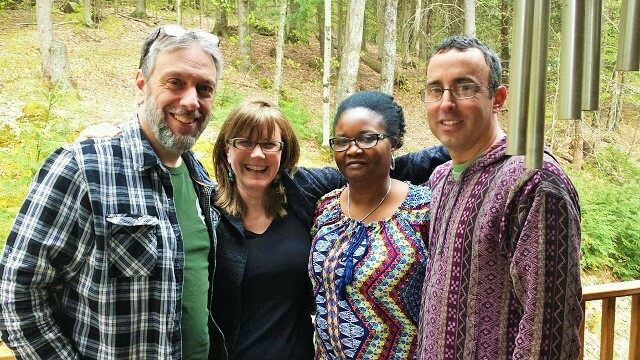 Rock Art remains independent, and while it had distributed to other states for awhile, cut back two years ago to distribute solely in Vermont, where it’s selling everything it can make and where owners Matt and Renee Nadeau seem content to leave it that way. Beyond the grand disparity in size, however, both Rock Art and Ballast Point have a grand diversity in the styles of beer they produce, and a great alacrity in throwing all sorts of stuff into the brew kettle. Rock Art is 20 years into the game now, and they’re playing it well. As an anniversary celebration, they’re going full solar power this spring for all their electrical needs, and look for a special can release to note the occasion.